Full of up- to-date-information! Find out what’s　up in Karuizawa now with this free magazine. 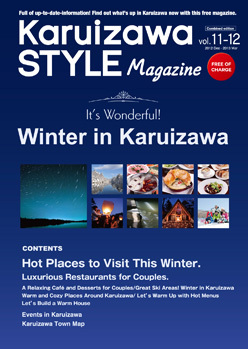 Free Magazine Now you can enjoy reading Karuizawa Style Magazine on Website. ―Hot places to visit this winter. ―Great ski areas! Winter in Karuizawa. ―Warm and cozy places around Karuizawa. ―Let’s warm up with hot menus. ―Let’s build a warm house. The download of "MPV viewer" please click the banner of follows. Copyright © 2019 AD AID Inc. All Rights Reserved.